I have been in New York a couple of days and one thing I have noticed is that there is advertising everywhere. Even when I was going through security at the airport there was advertising in the bottom of the tray I put my bag in at the security check. Giant screens in Times Square, advertising on the stairs in the subway and people standing on corners with signs encouraging people to visit nearby bars and restaurants. 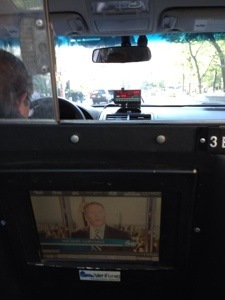 Today after walking through Central Park and The Met my feet were really aching, I jumped in a taxi and was shocked to find a TV screen in the back of the drivers seat with advertising. One of the adverts was for a service to pay the fare with my mobile phone, I think I need to check that out looks interesting. I did notice I was watching the screen rather than the view so had to make a determined effort to look out of the window. I was struck by how I’m always drawn to watching a screen, it feels like some kind of autopilot. Do you find if there is a screen to watch you will watch it?